This case does not come with the foam in the bottom or in the lid, this is an empty case. This case comes with solid sheets of 2" foam to fill the interior of the case. 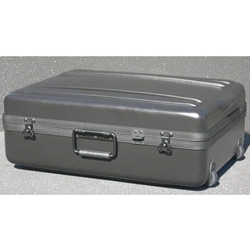 Must be customized by yourself or Atlas Case in order to fit your item(s) inside. This polyethylene case, with ball-bearing wheels and telescoping handle, is engineered for one person to handle heavy loads easily. It is lightweight, yet durable for reliable convenience and long life. Designed to protect valuable and sensitive equipment, they are strong enough to be shipped FedEx, UPS, and even through airline baggage handling. Interior Dimensions23.5" x 17.3" x 8"
Shipping Dimensions25" x 20" x 10"